Cake by Dawns Dreamy Cakes, Greenery from Ikea, hashtag wood piece handmade. Forget ladies only Baby Showers, the new trend is the Baby-Que! My sister recently celebrated her arrival to be with a Baby-Que, including her partner to be and all their family and friends (male and female). It was a lovely way to celebrate their special news and a great way to include all family members, especially the Father to be (who so often get left out of the festivities). 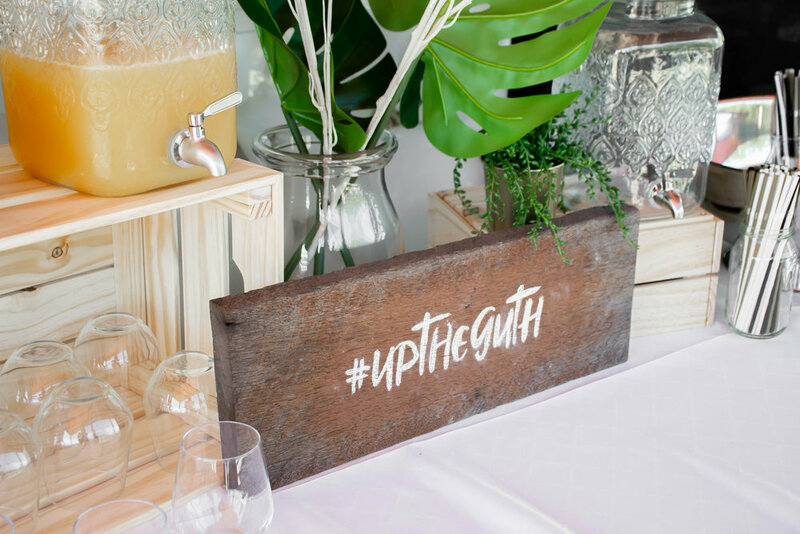 The party was put together at our parents house and had a rustic theme with home made pallet wall and greenery touches giving it a relaxed vibe. No baby games here just good food, good friends and lots of love. Grazing Table by Tesh’s Grazing & Styling, Balloon arch put together with balloons from Lombards. Baby in a fruit basket made by our clever Dad. The Mother and Father to be. Comparing bellies with “Poppy to be”. Cupcakes by Dawns Dreamy Cakes, Alice wears skirt and top from Kookai.